James Buchanan (April 23, 1791 – June 1, 1868) was the fifteenth president of the United States (1857–1861). He was the only bachelor president and the only resident of Pennsylvania to hold the office of President. He has been criticized for failing to prevent the country from sliding into the American Civil War. On Buchanan's final day as president, he remarked to the incoming Abraham Lincoln, "If you are as happy entering the presidency as I am in leaving it, then you are truly a happy man." He was born in a log cabin at Cove Gap, near Mercersburg, Pennsylvania, on April 23, 1791, to James Buchanan and Elizabeth Spear as the second of ten children. The Buchanan family are also direct descendants of James I, King of Scotland. James Buchanan was the eldest of 11 children. His father operated the trading post and had little time for his children. His mother, Elizabeth Speer Buchanan, was a religious woman who studied theBible and practiced her Christian faith. In 1796 the family moved to Mercersburg where they lived on the second floor above the family store. Buchanan's father demanded his son James learn bookkeeping skills. His formal education began at the Old Stone Academy in Mercersburg where he studied Greek and Latin. At age sixteen, James Buchanan was admitted to Dickinson College in Carlisle where he proved to be a conscientious and popular student. He was also, however, given to disruptive antics, and he was expelled from the school. Fortunately, an influential family friend intervened on his behalf and Buchanan was readmitted, graduating with distinction in 1809. At the urging of his father, Buchanan traveled to Lancaster to study law with James Hopkins and was admitted to the bar in Lancaster in 1812. After serving in the Pennsylvania House of Representatives (1814-1816), Buchanan devoted attention to his law practice, which soon prospered. In 1819 he became engaged to Ann Coleman, daughter of a wealthy Lancaster iron manufacturer, but as a result of a misunderstanding the engagement was ended. Her sudden death shortly thereafter left Buchanan desolate. He never married. He was elected to the Seventeenth and to the four succeeding Congresses on March 4, 1821 until March 3, 1831. He was chairman of the U.S. House Committee on the Judiciary. He was not a candidate for renomination in 1830. Buchanan served as one of the managers appointed by the House of Representatives in 1830 to conduct the impeachment proceedings against James H. Peck, judge of the United States District Court for the District of Missouri. Buchanan served as Minister to Russia from 1832 to 1834. Buchanan was elected as a Democrat to the United States Senate to fill the vacancy caused by the resignation of William Wilkins. He served from December 6, 1834, was reelected in 1837 and 1843, and resigned on March 5, 1845, to accept a Cabinet portfolio. He was chairman of the Committee on Foreign Relations. Buchanan served as Secretary of State in the Cabinet of President James K. Polk from 1845 to 1849, during which he negotiated the 1846 Oregon Treaty establishing the 49th parallel as the northern boundary in the western U.S. No Secretary of State has become President since James Buchanan. The electoral map of the 1856 election. 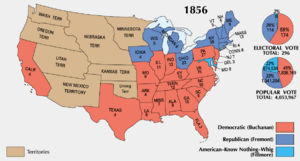 The Democrats nominated Buchanan in 1856 largely because he was in England during the Kansas-Nebraska debate and thus remained untainted by either side of the issue. He was nominated on the seventeenth ballot. Although he didn't want to run, he accepted the nomination. Millard Fillmore's "Know-Nothing" candidacy helped Buchanan defeat John C. Fremont, the first Republican candidate for president in 1856. 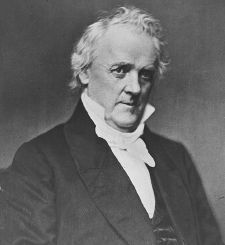 James Buchanan served from March 4, 1857 to March 3, 1861. In regard to the growing disharmony in the country, as President-elect he intended to sit out the crisis by maintaining a sectional balance in his appointments and persuading the people to accept constitutional law as the Supreme Court interpreted it. The Court was considering the legality of restricting slavery in the territories, and two justices hinted to Buchanan what the decision would be. In his inaugural address, along with promising not to run again, Buchanan referred to the territorial question as "happily, a matter of but little practical importance" since the Supreme Court was about to settle it "speedily and finally." Two days later, Chief Justice Roger B. Taney delivered the Dred Scott Decision, asserting that Congress had no constitutional power to exclude slavery in the territories. Much of Taney’s written judgment is widely interpreted as obiter dictum—statements made by a judge that are unnecessary to the outcome of the case, which in this case, while they delighted Southerners, created a furor in the North. Buchanan was widely believed to have been personally involved in the outcome of the case. 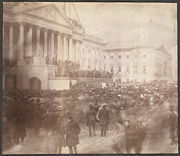 Many Northerners in attendance at Buchanan's inauguration claimed to have seen Justice Taney whispering at length to Buchanan before and during his address. Buchanan adhered to his desire to see the territorial question resolved by the Supreme Court. To further this, Buchanan personally lobbied his fellow Pennsylvanian Justice Robert Cooper Grier to vote with the majority in that case to uphold the right of owning slave property. Abraham Lincoln denounced him as an accomplice of the Slave Power, which Lincoln saw as a conspiracy of slave owners to seize control of the federal government and nationalize slavery. Buchanan's friends did a poor job defending him. Buchanan, however, faced further trouble on the territorial question. He threw the full prestige of his administration behind congressional approval of the Lecompton Constitution in Kansas, which would have admitted Kansas as a slave state, going so far as to offer patronage appointments and even cash bribes in exchange for votes. The Lecompton government of Kansas was unpopular to Northerners, as it was dominated by slaveholders who had enacted laws curtailing the rights of non-slaveholders. Even though the voters in Kansas had rejected the Lecompton Constitution, Buchanan managed to pass his bill through the House, but it was blocked in the Senate by Northerners led by Stephen A. Douglas. Eventually, Congress voted to call a new vote on the Lecompton Constitution, a move which infuriated Southerners. Buchanan and Douglas engaged in an all-out struggle for control of the Democratic party during 1859 - 1860, with Buchanan using his patronage powers and Douglas rallying the grassroots. Buchanan lost control of the greatly weakened party. Economic troubles also plagued Buchanan's administration with the outbreak of the Panic of 1857. The government suddenly faced a shortfall of revenue, partly because of the Democrats' successful push to lower the tariff. Buchanan's administration, at the behest of Treasury Secretary Howell Cobb, began issuing deficit financing for the government, a move which flew in the face of two decades of Democratic support for hard-money policies and allowed Republicans to attack Buchanan for financial mismanagement. When Republicans won a plurality in the House in 1858, every significant bill they passed fell before southern votes in the Senate or a Presidential veto. The Federal Government reached a stalemate. Bitter hostility between Republicans and Southern members prevailed on the floor of Congress. Sectional strife rose to such a pitch in 1860 that the Democratic Party split. Buchanan played little part as the national convention meeting in Charleston deadlocked. The southern wing walked out of the Charleston convention and nominated its own candidate for the presidency, incumbent Vice President John C. Breckinridge, whom Buchanan refused to support. The remainder of the party finally nominated Buchanan's archenemy, Douglas. Consequently, when the Republicans nominated Abraham Lincoln, it was a foregone conclusion that he would be elected even though his name appeared on no southern ballot. Buchanan watched silently as South Carolina seceded on December 20, followed by six other cotton states, and by February, they formed the Confederate States of America. Eight slave states refused to join. Beginning in late December, Buchanan reorganized his cabinet, ousting Confederate sympathizers and replacing them with hard-line nationalists Jeremiah S. Black, Edwin M. Stanton, Joseph Holt, and John Adams Dix. These conservative Democrats strongly believed in American nationalism and refused to countenance secession. At one point, Treasury Secretary Dix ordered Treasury agents in New Orleans, "If any man pulls down the American flag, shoot him on the spot." Before Buchanan left office, seven slave states seceded, the Confederacy was formed, all arsenals and forts were lost except Fort Sumter and two remote ones, and a fourth of all federal soldiers surrendered to Texas troops. The government decided to hold on to Fort Sumter, which was located in the center of Charleston, South Carolina, the most visible spot in the Confederacy. On January 5, Buchanan sent a civilian steamer Star of the West to carry reinforcements and supplies to Fort Sumter. On January 9, 1861, South Carolina state batteries opened fire on the Star of the West, which returned to New York. Politically paralyzed, Buchanan made no further moves to prepare for war. In 1866 Buchanan published Mr Buchanan's Administration on the Eve of the Rebellion- the first presidential memoir. He died June 1, 1868, at the age of 77 at his home at Wheatland. He was interred in Woodward Hill Cemetery, in Lancaster. On the day before his death, he predicted that "history will vindicate my memory," but historians continue mainly to emphasize his failure to deal with secession. Nevins, Allan. The Emergence of Lincoln. Scribner, 1950. ISBN 0684104156, v. 1 ISBN 0684104164; v. 2. v. 1 Douglas, Buchanan, and Party Chaos, 1857-1859. v. 2 Prologue to Civil War, 1859-1861. Rhodes, James Ford. History of the United States from the Compromise of 1850 to the McKinley-Bryan Campaign of 1896. Port Washington, NY: Kennikat Press, 1967., c1892-1919 Volume: 2. This page was last modified on 15 March 2018, at 15:28.